With installation due for completion in June 2018, equine patients undergoing bone scans will receive improved comfort and protection, and scans will be more efficient. We are replacing our existing scintigraphy system which was the first totally digital camera for horses in Australia as it has reached the end of its lifespan. The German-made Equine Scanner H.R. 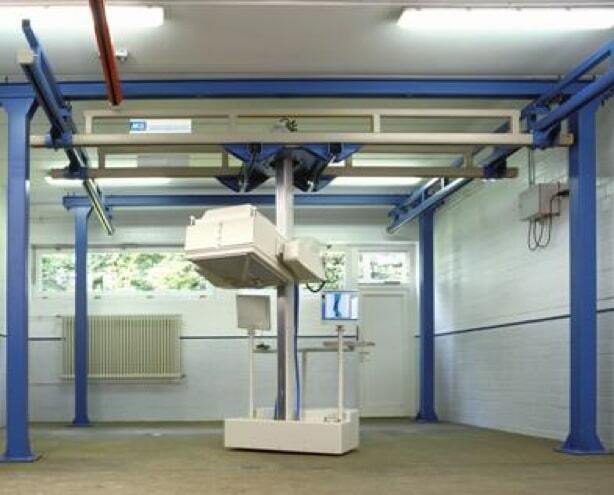 Scintron features a gamma camera system with a high-resolution detector; a fast, mobile and low noise electrical movement of the detector and a self-supporting crane stand construction. At U-Vet Werribee Equine Centre, we are able to perform scans on all areas of the body from the feet to the head. Scintigraphy is especially useful for cases where the source of the lameness is difficult to localise, where the site of lameness has been identified but there are no changes on radiographs, where multiple sites of lameness are suspected and for problems of the spine, pelvis and sacroiliac regions. The horse is usually admitted the day before the scan and depending on results the horse is able to go home 24 hours post scintigraphy. Our qualified and very experienced nuclear medicine staff keep this sophisticated and sensitive equipment running smoothly and accurately. With over 14 years history of scintigraphy, we have accumulated a vast database of images with which we can compare each new case. During the upgrade our scintigraphy system, just one of our wide range of imaging services, will be unavailable from 9 April and 8 June 2018, however during this time scintigraphy scanning will be available at our other equine facility, Goulburn Valley Equine Hospital. Learn more about our imaging modalities.